As one of two major American motorcycle manufacturers to survive the Great Depression (along with Indian), the company has survived numerous ownership arrangements, subsidiary arrangements (e.g., Aermacchi 1974-1978 and Buell 1987-2009), periods of poor economic health and product quality, as well as intense global competition — to become the world's fifth largest motorcycle manufacturer and an iconic brand widely known for its loyal following — with owner clubs and events worldwide as well as a company sponsored brand-focused museum. Harley-Davidson manufactures its motorcycles at factories in York, Pennsylvania; Milwaukee, Wisconsin; Kansas City, Missouri; Manaus, Brazil; and Bawal, India — and markets its products worldwide. Production in 1905 and 1906 were all single-cylinder models with 26.84 cubic inches (440 cc) engines. 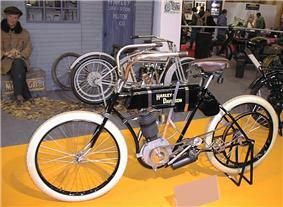 In February 1907 a prototype model with a 45-degree V-Twin engine was displayed at the Chicago Automobile Show. 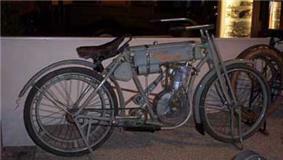 Although shown and advertised, very few V-Twin models were built between 1907 and 1910. These first V-Twins displaced 53.68 cubic inches (880 cc) and produced about 7 horsepower (5.2 kW). This gave about double the power of the first singles. Top speed was about 60 mph (100 km/h). Production jumped from 450 motorcycles in 1908 to 1,149 machines in 1909. 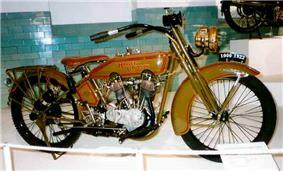 In 1911, an improved V-Twin model was introduced. The new engine had mechanically operated intake valves, as opposed to the "automatic" intake valves used on earlier V-Twins that opened by engine vacuum. With a displacement of 49.48 cubic inches (811 cc), the 1911 V-Twin was smaller than earlier twins, but gave better performance. 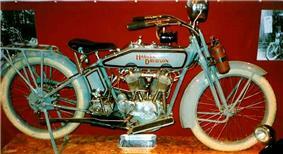 After 1913 the majority of bikes produced by Harley-Davidson would be V-Twin models. In 1917, the United States entered World War I and the military demanded motorcycles for the war effort. Harleys had already been used by the military in the Pancho Villa Expedition but World War I was the first time the motorcycle had been adopted for combat service. 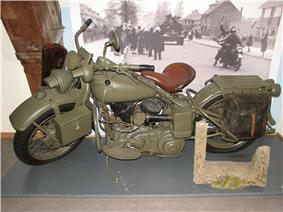 The U.S. military purchased over 15,000 motorcycles from Harley Davidson during World War I. During the 1920s, several improvements were put in place, such as a new 74 cubic inch (1,212.6 cc) V-Twin, introduced in 1922, and the "Teardrop" gas tank in 1925. 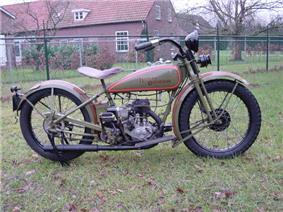 A front brake was added in 1928 although notably only on the J/JD models. In the late summer of 1929, Harley-Davidson introduced its 45 cubic inches (737 cc) flathead V-Twin to compete with the Indian 101 Scout and the Excelsior Super X. This was the "D" model, produced from 1929 to 1931. Riders of Indian motorcycles derisively referred to this model as the "three cylinder Harley" because the generator was upright and parallel to the front cylinder. The 2.745 in (69.7 mm) bore and 3.8125 in (96.8 mm) stroke would continue in most versions of the 750 engine; exceptions include the XA and the XR-750. The Great Depression began a few months after the introduction of their 45 cubic inch model. 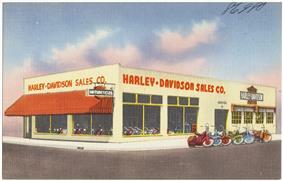 Harley-Davidson's sales fell from 21,000 in 1929 to 3,703 in 1933. Despite this, Harley-Davidson unveiled a new lineup for 1934, which included a flathead engine and Art Deco styling. 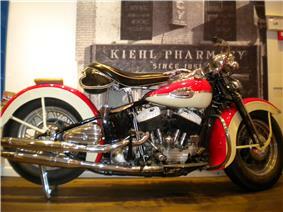 In the mid-1930s, Alfred Rich Child opened a production line in Japan with the 74 cubic inches (1,210 cc) VL. The Japanese license-holder, Sankyo Seiyako Corporation, severed its business relations with Harley-Davidson in 1936 and continued manufacturing the VL under the Rikuo name. An 80 cubic inches (1,300 cc) flathead engine was added to the line in 1935, by which time the single-cylinder motorcycles had been discontinued. In 1936, the 61E and 61EL models with the "Knucklehead" OHV engines was introduced. Valvetrain problems in early Knucklehead engines required a redesign halfway through its first year of production and retrofitting of the new valvetrain on earlier engines. By 1937, all Harley-Davidson's flathead engines were equipped with dry-sump oil recirculation systems similar to the one introduced in the "Knucklehead" OHV engine. The revised 74 cubic inches (1,210 cc) V and VL models were renamed U and UL, the 80 cubic inches (1,300 cc) VH and VLH to be renamed UH and ULH, and the 45 cubic inches (740 cc) R to be renamed W.
In 1941, the 74 cubic inches (1,210 cc) "Knucklehead" was introduced as the F and the FL. The 80 cubic inches (1,300 cc) flathead UH and ULH models were discontinued after 1941, while the 74" U & UL flathead models were produced up to 1948. Harley-Davidson, on the eve of World War II, was already supplying the Army with a military-specific version of its 45 cubic inches (740 cc) WL line, called the WLA. The A in this case stood for "Army". Upon the outbreak of war, the company, along with most other manufacturing enterprises, shifted to war work. More than 90,000 military motorcycles, mostly WLAs and WLCs (the Canadian version) were produced, many to be provided to allies. Harley-Davidson received two Army-Navy ‘E’ Awards, one in 1943 and the other in 1945, which were awarded for Excellence in Production. Prior to WWII, Harley-Davidson's were produced in Japan under license to the company Rikuo (Rikuo Internal Combustion Company) starting in 1929 under the name of Harley-Davidson and using the company's tooling, and later under the name Rikuo. Production continued until 1958. In 1952, following their application to the U.S. Tariff Commission for a 40% tax on imported motorcycles, Harley-Davidson was charged with restrictive practices. In the early eighties, Harley-Davidson claimed that Japanese manufacturers were importing motorcycles into the US in such volume as to harm or threaten to harm domestic producers. After an investigation by the U.S. International Trade Commission, President Reagan imposed in 1983 a 45% tariff on imported bikes with engine capacities greater than 700 cc. 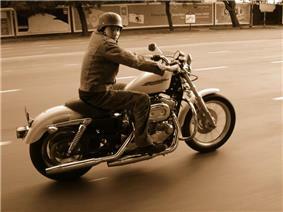 Harley-Davidson subsequently rejected offers of assistance from Japanese motorcycle makers. However, the company did offer to drop the request for the tariff in exchange for loan guarantees from the Japanese. 1993 and 1994 saw the replacement of FXR models with the Dyna (FXD), which became the sole rubber mount FX Big Twin frame in 1995. 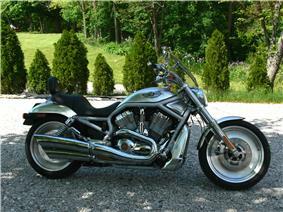 The FXR was revived briefly from 1999 to 2000 for special limited editions (FXR2, FXR3 & FXR4). 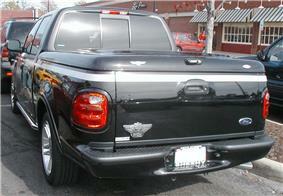 In 2000, Ford Motor Company added a Harley-Davidson trim level to the F-150, which was produced until 2003. In 2004, Ford introduced a Harley-Davidson trim level to the Super Duty, which was produced until the trim was discontinued for the 2011 model year. Production of the F-150 Harley-Davidson resumed in 2006 and continued until 2012, when Ford discontinued the F-150 Harley-Davidson edition for the 2013 model year due to low sales, accounting for only 1-2% of the F-150's total sales. Harley-Davidson's association with sportbike manufacturer Buell Motorcycle Company began in 1987 when they supplied Buell with fifty surplus XR1000 engines. Buell continued to buy engines from Harley-Davidson until 1993, when Harley-Davidson bought 49% of the Buell Motorcycle Company. 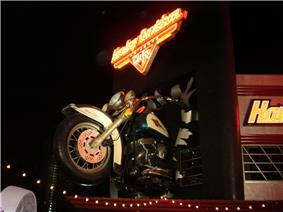 Harley-Davidson increased its share in Buell to ninety-eight percent in 1998, and to complete ownership in 2003. In an attempt to attract newcomers to motorcycling in general and to Harley-Davidson in particular, Buell developed a low-cost, low-maintenance motorcycle. The resulting single-cylinder Buell Blast was introduced in 2000, and was made through 2009, which, according to Buell, was to be the final year of production. On October 15, 2009, Harley-Davidson announced that it would divest its interest in MV Agusta. Harley-Davidson Inc. sold Italian motorcycle maker MV Agusta to Claudio Castiglioni, ending the transaction in the first week of August 2010. 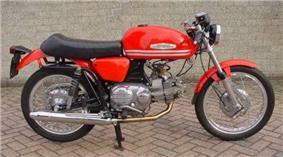 Castiglioni is the company's former owner and had been MV Agusta's chairman since Harley-Davidson bought it in 2008. According to Interbrand, the value of the Harley-Davidson brand fell by 43% to $4.34 billion in 2009. The fall in value is believed to be connected to the 66% drop in the company profits in two quarters of the previous year. On April 29, 2010, Harley-Davidson stated that they must cut $54 million in manufacturing costs from its production facilities in Wisconsin, and that they would explore alternative U.S. sites to accomplish this. The announcement came in the wake of a massive company-wide restructuring, which began in early 2009 and involved the closing of two factories, one distribution center, and the planned elimination of nearly 25% of its total workforce (around 3,500 employees). The company announced on September 14, 2010 that it would remain in Wisconsin. 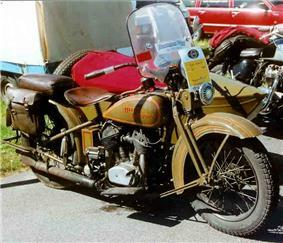 Flathead, 1930–1948 (1,200 cc) and 1935–1941 (1,300 cc). Twin Cam 103, 2003–2006, 2009, 103 cubic inch (1,690 cc) (engines for C.V.O. models), Standard on 2011 Touring models: Ultra Limited, Road King Classic and Road Glide Ultra and optional on the Road Glide Custom and Street Glide. Standard on most 2012 models excluding Sportsters and 2 Dynas (Street Bob and Super Glide Custom). Standard on all 2014 dyna models. The Revolution engine is based on the VR-1000 Superbike race program, co-developed by Harley-Davidson's Powertrain Engineering team and Porsche Engineering in Stuttgart, Germany. It is a liquid cooled, dual overhead cam, internally counterbalanced 60 degree V-twin engine with a displacement of 69 cubic inch (1,130 cc), producing 115 hp (86 kW) at 8,250 rpm at the crank, with a redline of 9,000 rpm. It was introduced for the new V-Rod line in 2001 for the 2002 model year, starting with the single VRSCA (V-Twin Racing Street Custom) model. A 1,250 cc Screamin' Eagle version of the Revolution engine was made available for 2005 and 2006, and was present thereafter in a single production model from 2005 to 2007. In 2008, the 1,250 cc Revolution Engine became standard for the entire VRSC line. Harley-Davidson claims 123 hp (92 kW) at the crank for the 2008 VRSCAW model. The VRXSE Destroyer is equipped with a stroker (75 mm crank) Screamin' Eagle 79 cubic inch (1,300 cc) Revolution Engine, producing more than 165 hp (123 kW). 750 cc and 500 cc versions of the Revolution engine will be used in Harley Davidson's new Street line of light cruisers. These motors, named the Revolution X, use a single overhead cam, screw and locknut valve adjustment, a single internal counterbalancer, and vertically split crankcases; all of these changes making it different from the original Revolution design. 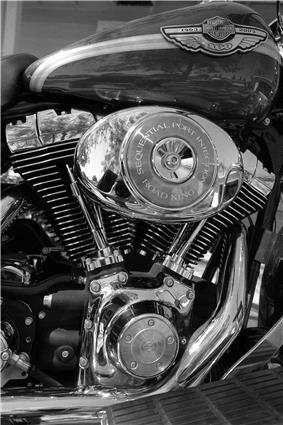 The first Harley-Davidson motorcycles were powered by single-cylinder IOE engines with the inlet valve operated by engine vacuum. Singles of this type continued to be made until 1913, when a pushrod and rocker system was used to operate the overhead inlet valve on the single, a similar system having been used on their V-twins since 1911. Single-cylinder motorcycle engines were discontinued in 1918. The frame was modified for the 1994 model year when the oil tank went under the transmission and the battery was moved inboard from under the right saddlebag to under the seat. In 1997, the frame was again modified to allow for a larger battery under the seat and to lower seat height. In 2007, Harley-Davidson introduced the 96 cubic inches (1,570 cubic centimetres) Twin Cam 96 engine, as well the six-speed transmission to give the rider better speeds on the highway. For the 2009 model year, Harley-Davidson redesigned the entire touring range with several changes, including a new frame, new swingarm, a completely revised engine-mounting system, 17-inch (430 mm) front wheels for all but the FLHRC Road King Classic, and a 2–1–2 exhaust. The changes result in greater load carrying capacity, better handling, a smoother engine, longer range and less exhaust heat transmitted to the rider and passenger. Also released for the 2009 model year is the FLHTCUTG Tri-Glide Ultra Classic, the first three-wheeled Harley since the Servi-Car was discontinued in 1973. The model features a unique frame and a 103-cubic-inch (1,690 cc) engine exclusive to the trike. In 2014, Harley-Davidson released a redesign for specific touring bikes and called it "Project Rushmore". Changes include a new 103CI High Output engine, one handed easy open saddlebags and compartments, a new Boom! Box Infotainment system with either 4.3" or 6.5" screens featuring touchscreen functionality [6.5" models only], Bluetooth (media and phone with approved compatible devices), available GPS and SiriusXM, Text-to-Speech functionality (with approved compatible devices) and USB connectivity with charging. Other features include ABS with Reflex linked brakes, improved styling, Halogen or LED lighting and upgraded passenger comfort. 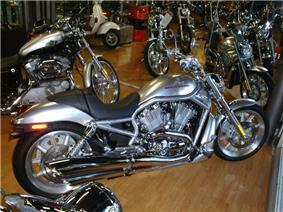 These big-twin motorcycles capitalize on Harley's strong value on tradition. With the rear-wheel suspension hidden under the transmission, they are visually similar to the "hardtail" choppers popular in the 1960s and 1970s, as well as from their own earlier history. In keeping with that tradition, Harley offers Softail models with "Springer" front ends and "Heritage" styling that incorporate design cues from throughout their history. Softail models that use 21" Front Wheels have designations that begin with FXST, e.g., FXSTB (Night Train), FXSTD (Deuce), and FXSTS (Springer). Softail models that use 16" Front Wheels have designations beginning with FLST, e.g., FLSTF (Fat Boy), FLSTC (Heritage Softail Classic), FLSTN (Softail Deluxe) and FLS (Softail Slim). Prior to 2008, Dyna models typically featured a narrow, XL-style front fork and front wheel, which the manufacturer included the letter "X" in the model designation to indicate. This lineup traditionally included the Super Glide (FXD), Super Glide Custom (FXDC), Street Bob (FXDB), and Low Rider (FXDL). One exception was the Wide Glide (FXDWG), which maintained the thickness of the XL forks and a narrow front wheel, but positioned the forks on wider triple-trees that give a beefier appearance. In 2008, the Dyna Fat Bob (FXDF) was introduced to the Dyna lineup, featuring aggressive styling like a new 2–1–2 exhaust, twin headlamps, a 180 mm rear tire, and, for the first time in the Dyna lineup, a 130 mm front tire. For the 2012 model year, the Dyna Switchback (FLD) became the first Dyna to break the tradition of having an FX model designation: with detachable painted hard saddlebags, touring windshield, larger fork tubes, headlight nacelle and a wide front tire with full fender. The new front end resembled the big-twin FL models from 1968-1971. 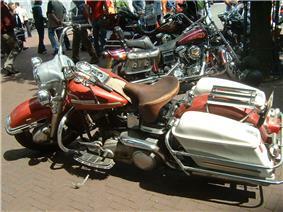 The Dyna family used the 88-cubic-inch (1,440 cc) twin cam from 1999 to 2006. In 2007, the displacement was increased to 96 cubic inches (1,570 cc) as the factory increased the stroke to 4.375 inches (111.1 mm). 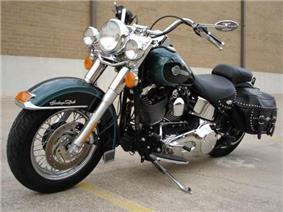 For the 2012 model year, the manufacturer began to offer Dyna models with the 103-cubic-inch (1,690 cc) upgrade. All Dyna models use a rubber-mounted engine to isolate engine vibration. Dyna models utilize the big-twin engine (F), small-diameter telescopic forks similar to those used on the Sportster (X) until 2012 when one model used the large diameter forks similar in appearance to those used on the Touring (L) models, and the Dyna chassis (D). Therefore, except for the FLD from 2012 to the present, all Dyna models have designations that begin with FXD, e.g., FXDWG (Dyna Wide Glide) and FXDL (Dyna Low Rider). In the 2007 model year, Harley-Davidson celebrated the 50th anniversary of the Sportster and produced a limited edition called the XL50, of which only 2000 were made for sale worldwide. 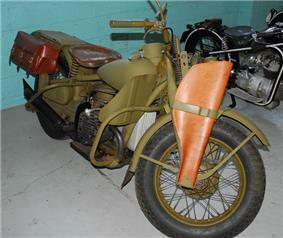 Each motorcycle was individually numbered and came in one of two colors, Mirage Pearl Orange or Vivid Black. Also in 2007, electronic fuel injection was introduced to the Sportster family, and the Nightster model was introduced in mid-year. In 2009, Harley-Davidson added the Iron 883 to the Sportster line, as part of the Dark Custom series. 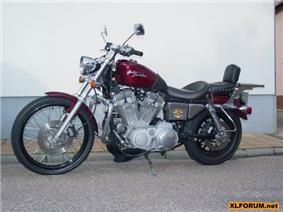 In the 2008 model year, Harley-Davidson released the XR1200 Sportster in Europe, Africa, and the Middle East. The XR1200 had an Evolution engine tuned to produce 91 bhp (68 kW), four-piston dual front disc brakes, and an aluminum swing arm. Motorcyclist featured the XR1200 on the cover of its July 2008 issue and was generally positive about it in their "First Ride" story, in which Harley-Davidson was repeatedly asked to sell it in the United States. One possible reason for the delayed availability in the United States was the fact that Harley-Davidson had to obtain the "XR1200" naming rights from Storz Performance, a Harley customizing shop in Ventura, Calif. The XR1200 was released in the United States in 2009 in a special color scheme including Mirage Orange highlighting its dirt-tracker heritage. The first 750 XR1200 models in 2009 were pre-ordered and came with a number 1 tag for the front of the bike, autographed by Kenny Coolbeth and Scott Parker and a thank you/welcome letter from the company, signed by Bill Davidson. 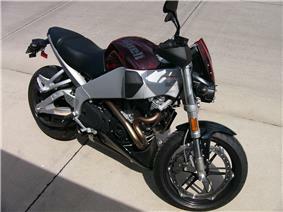 The XR1200 was discontinued in model year 2013. Introduced in 2001, the VRSC family bears little resemblance to Harley's more traditional lineup. Competing against Japanese and American muscle bikes in the upcoming power cruiser segment, the "V-Rod" makes use of an engine developed jointly with Porsche that, for the first time in Harley history, incorporates overhead cams and liquid cooling. The V-Rod is visually distinctive, easily identified by the 60-degree V-Twin engine, the radiator and the hydroformed frame members that support the round-topped air cleaner cover. The VRSC platform was also used for factory drag-racing motorcycles. The Street, Harley Davidson's newest platform and their first all new platform in thirteen years, was designed to appeal to younger riders looking for a lighter bike. The Street 750 model was launched in India at the 2014 Indian Auto Expo, Delhi-NCR on 5 February 2014. The Street 750 weighs 218 kg and has a ground clearance of 144 mm giving it the lowest weight and the highest ground clearance of Harley-Davidson motorcycles currently available. The Street 750 and the smaller-displacement Street 500 will be available in late 2014. Street series motorcycles for the North American market will be built in Harley-Davidson's Kansas City, Missouri plant, while those for other markets around the world will be built completely in their plant in Bawal, India. ^ a b c d Automotive – RSS Feed. Popularmechanics.com. Retrieved on July 7, 2011. ^ a b c d Wagner, 2003. pp.45–62. ^ Harley-Davidson Museum, Milwaukee, Wisconsin, various artifacts, ephemera, and placards on display. One placard states "Harley-Davidson began as a motorcycle manufacturer unlike competitors such as Indian and Pope, which has previous histories in bicycling prior to building motorcycles. 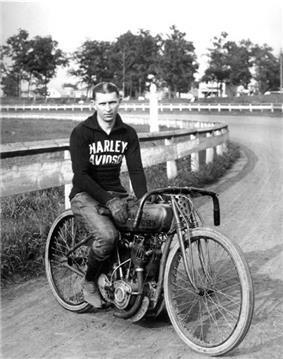 The many connections between bicycling and motorcycling prompted Harley-Davidson to begin selling bicycles in 1917. Despite heavy promotion, sales were disappointing and production was discontinued in 1923." ^ a b History. Harley Hummer Club (2010-05-17). Retrieved on July 7, 2011. ^ a b Harley Hummer. Com. Harleyhummer.com. Retrieved on July 7, 2011. 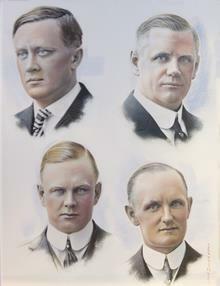 ^ a b Gordon, Raymond G., Jr. (ed. ), 2005. Ethnologue: Languages of the World, Fifteenth edition. Dallas, Tex. : SIL International. Online version: http://www.ethnologue.com/. ^ L. Dupree, "Afghānistān: (iv.) ethnocgraphy", in Encyclopædia Iranica, Online Edition 2006, (LINK). 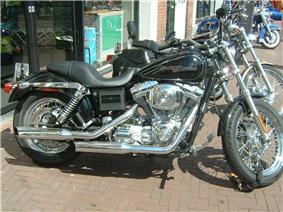 ^ 2009 Harley-Davidson 2009 model line. Harley-davidson.com. Retrieved on July 7, 2011. ^ 2009 Harley-Davidson Tri-Glide Ultra Classic. Harley-davidson.com. Retrieved on July 7, 2011. 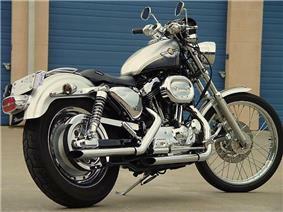 ^ First Ride: 2004 Harley-Davidson Sportster MotorcyclesMotorcycle Cruiser. 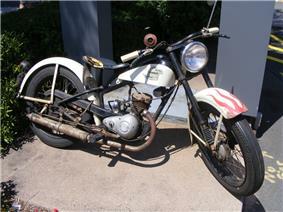 Motorcyclecruiser.com (2011-02-28). Retrieved on July 7, 2011. ^ a b c Harley Just Keeps On Cruisin'. Business Week (2006-11-06). Retrieved on July 7, 2011. ^ The Great American Factory TourHarley-Davidson USA: . Harley-davidson.com. Retrieved on July 7, 2011. ^ Museum Customized by Harley-DavidsonHarley-Davidson USA: . Harley-davidson.com. Retrieved on July 7, 2011. ^ Ride Home. Harley-davidson.com. Retrieved on July 7, 2011. ^ Harleyfest Example. 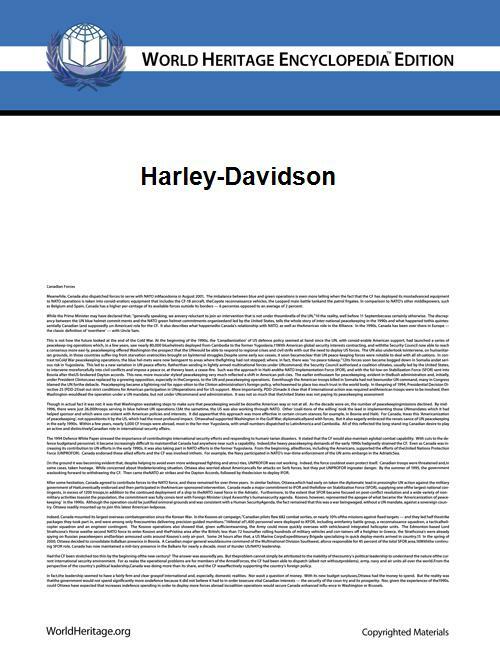 Harley-davidson.com (2008-08-28). Retrieved on July 7, 2011. ^ The 105th. Harley-davidson.com. Retrieved on July 7, 2011. ^ U.S. Department of Labor – Labor Hall of Fame – Harley-Davidson. Dol.gov. Retrieved on July 7, 2011. Beginning with Harley-Davidson's 90th anniversary in 1993, Harley-Davidson has had celebratory rides to Milwaukee called the "Ride Home". This new tradition has continued every five years, and is referred to unofficially as "Harleyfest", in line with Milwaukee's other festivals (Summerfest, German fest, Festa Italiana, etc.). This event brings Harley riders from all around the world. The 105th anniversary celebration was held on August 28–31, 2008, and included events in Milwaukee, Waukesha, Racine, and Kenosha counties, in Southeast Wisconsin. 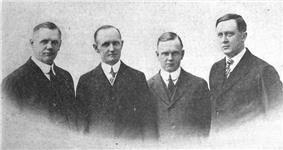 The 110th anniversary celebration was held on August 29–31, 2013. Harley-Davidson established the Harley Owners Group (HOG) in 1983 to build on the loyalty of Harley-Davidson enthusiasts as a means to promote a lifestyle alongside its products. The HOG also opened new revenue streams for the company, with the production of tie-in merchandise offered to club members, numbering more than one million. Other motorcycle brands, and other and consumer brands outside motorcycling, have also tried to create factory-sponsored community marketing clubs of their own. HOG members typically spend 30% more than other Harley owners, on such items as clothing and Harley-Davidson-sponsored events. Harley-Davidson FL "big twins" normally had heavy steel fenders, chrome trim, and other ornate and heavy accessories. After World War II, riders wanting more speed would often shorten the fenders or take them off completely to reduce the weight of the motorcycle. These bikes were called "bobbers" or sometimes "choppers" because parts considered unnecessary were chopped off. Those who made or rode choppers and bobbers, especially members of outlaw bike gangs like the Hells Angels, referred to stock FLs as "garbage wagons". Harley-Davidson motorcycles has long been associated with the sub-cultures of the biker, motorcycle clubs, and Outlaw motorcycle clubs. Harley-Davidson attracts a loyal brand community, with licensing of the Harley-Davidson logo accounting for almost 5% of the company's net revenue ($41 million in 2004). 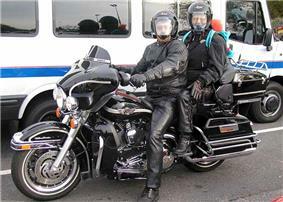 Harley-Davidson supplies many American police forces with their motorcycle fleets. In 1987, the median household income of a Harley-Davidson rider was $38,000. By 1997, the median household income for those riders had more than doubled, to $83,000. According to a recent Harley-Davidson study, in 1987 half of all Harley riders were under age 35. Now, only 15% of Harley buyers are under 35, and as of 2005, the median age had risen to 46.7.